A message in the Forum inquired on sorting strings in APL with a custom comparison function. The operand function ⍺ ⍺⍺ ⍵ is required to return ¯1, 0, or 1, according to whether ⍺ is less than, equal to, or greater than ⍵. In QS, the phrase s←⍵ ⍺⍺¨ ⍵⌷⍨?≢⍵ compares each element of ⍵ against a randomly chosen pivot ⍵⌷⍨?≢⍵; the function then applies recursively to the elements of ⍵ which are less than the pivot (0>s) and those which are greater than the pivot (0<s). 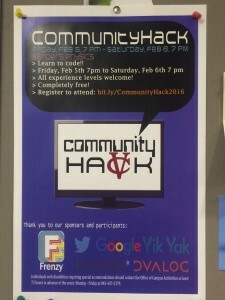 Thanks to our dear friend Dr. Ray Polivka, Dan Baronet and I had the opportunity to travel to Vassar College to participate in their Community Hackathon held on 5-6 February 2016. “What’s a hackathon?” you ask? Stu dents from Vassar as well as nearby colleges and high schools were invited to attend. In other words, it was a great opportunity to introduce APL to a new generation. 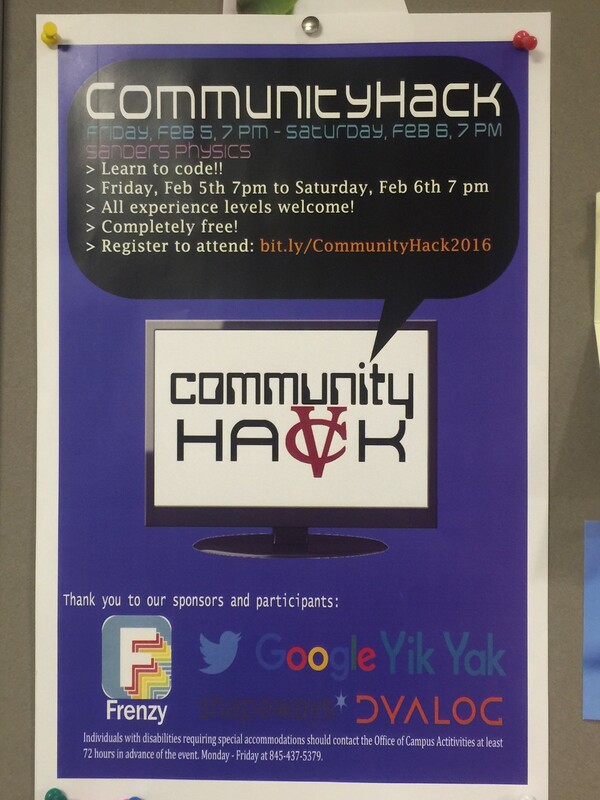 As this was our first Hackathon, we had no idea what to expect. Laura, the Hackathon’s organizer, did a wonderful job organizing the event and making us feel welcome. 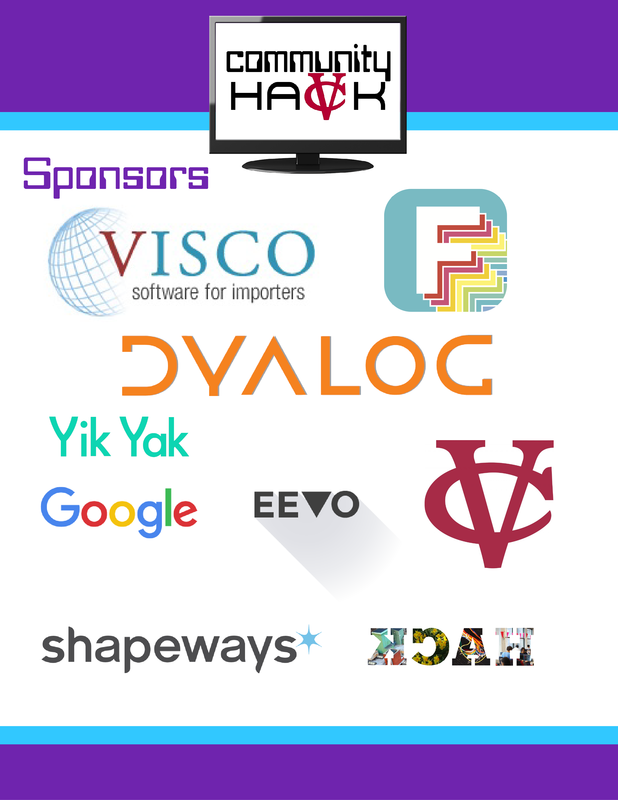 We were invited to give an hour long presentation and Dyalog was listed as an event sponsor. 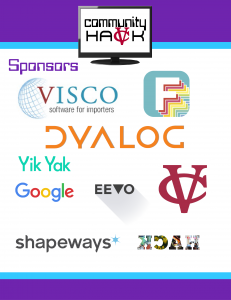 The Hackathon was a 24 hour event where students were encouraged to split up into groups and pick a problem to solve. During the course of the event, presentations were made on a variety of subjects including “Autonomous Robots Test Ideas About the Evolution of Brains”, “How to make games quick!”, “Virtual Reality”, and of course “Hacking with APL”. Friday evening started with introductions and ice-breakers. During our introduction, I was able to talk a bit about APL and the presentation we would be making on Saturday. Apparently this generated some interest as a number of students came up to Dan, Ray, Jon McGrew and me to ask about APL. We spent several hours showing them APL, to which they seemed eagerly receptive. I had the pleasure of working with Grace, a CS sophomore, to implement APL (A Puppy Language) in APL. Her project idea was to write an application for potential puppy owners to use so they could get an idea of the responsibility of owning and caring for a puppy. We worked into the wee hours of the night and wound up implementing a multi-threaded domain-specific-language (DSL) where the “puppy”, running in a separate thread, would react to commands typed into the APL session. Negative actions and ignoring the puppy would cause the the puppy’s happiness points (PHPs) to decrease whereas positive actions would increase PHPs. Grace seemed to really enjoy working with APL and returned to the hackathon twice on Saturday as her schedule permitted to continue work on her project. Saturday, I was slightly concerned that following a talk on virtual reality, APL might not seem all that “cool”, but my fears were allayed for, as I was waiting before my presentation, several students asked the person at the registration desk specifically about the APL presentation. The presentation went rather well. Watching the jaw-dropping “Wow!” expressions on the faces of many of the students as we showed the power of APL notation made me reminisce back to the time when I first learned APL and was amazed at what I could do with a computer. It also reminded me how blessed I’ve been to have used APL throughout my career. Our participation in the Hackathon was a great experience. 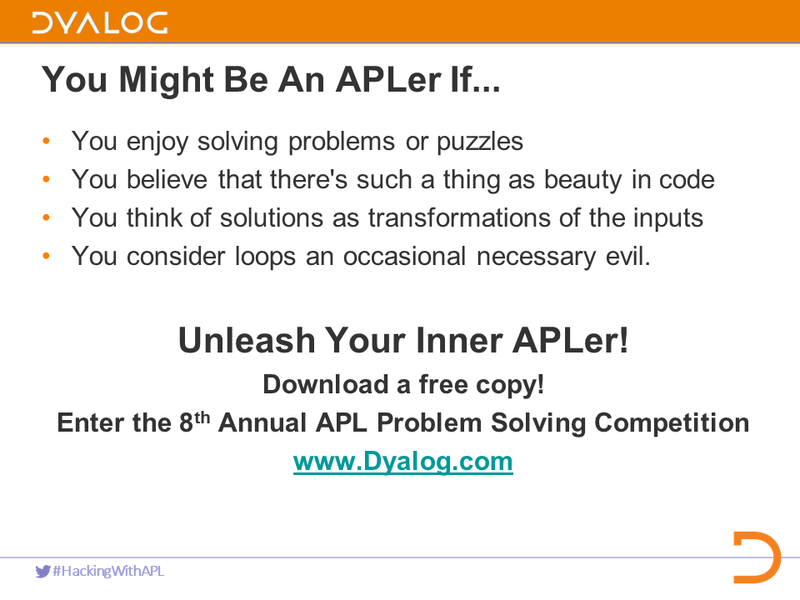 We were able to show Dyalog to close to 100 students, promote the upcoming APL Problem Solving Competition, and encourage people to download and try Dyalog – we had 18 student downloads over the Hackathon weekend. This may have been our first Hackathon, but I’m certain it won’t be our last.